Robert E. Park has long been recognized as one of the most influential thinkers in early American sociology, yet virtually all of his works appearing before 1913 were published in popular magazines and were dismissed as nonsociological muckraking. 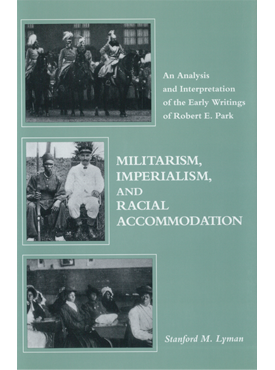 In Militarism, Imperialism, and Racial Accommodation: An Analysis and Interpretation of the Early Writings of Robert E. Park, Stanford M. Lyman examines and reprints many of these little-known works, including Park’s essays on German military organization, his exposés of the atrocities committed by Belgium’s Leopold II in the Congo State, his studies of the black community in Winston-Salem, North Carolina, and of Booker T. Washington’s agricultural education program at Tuskegee, Alabama. Lyman shows clearly that Park’s essays, written outside the academy, formulated a far more complex perspective on modern modes of evil than any proposed by his contemporaries, thereby influencing sociological debates for decades to come. By writing his essays on topical subjects and by publishing them for a public audience, Park dramatized his profound belief that the struggle to achieve racial accommodation and to establish a true and lasting democracy is a concern for all.